The Graduated Spine Support System provides a dynamic back support for patients suffering from medical conditions that require daily spinal support, notably those which cause joint hypermobility and chronic musculoskeletal issues. Using data assessed by an integrated neural network, the lightweight cable mechanism of the Graduated Spine Support System can easily and precisely adjust to the wearer's rigidity and support level requirements. The winner of the Reshape Competition, organized by Noumena in partnership with IN(3D)USTRY, from needs to solutions is the Graduated Spine Support System, GS. 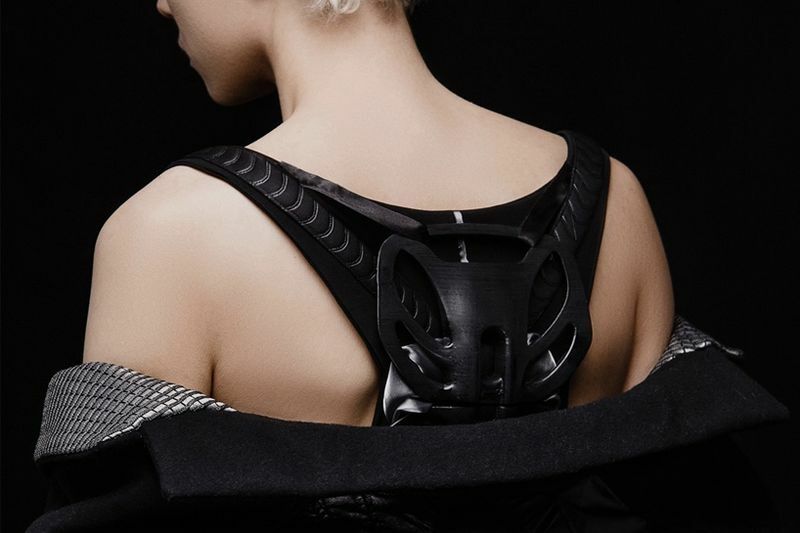 Designed by Snezhana Paderina and Nikita Replyanski, it is produced with the primary aim of reinventing the orthopaedic brace so that people with medical conditions can have both spinal support with a broad range of mobility, and also look fashionable while wearing the system support wearable. In the aim to achieve the main goal, the team carried out a careful analysis of existing products on the market and was able to notice some restrictions and flaws which included excess weight, limited freedom of movement, and use of inefficient materials. The device is designed to enhance existing musculature and secures the spinal column to provide an adaptive 'superpower' that can be utilized for people performing strenuous tasks, such as moving furniture or working in a warehouse. The spinal support system's high degree of comfort comes from meticulously selected, high-performance tech fabrics and its atomically shaped structure. The integrated neural network and flexible spine and smart behaviour are achieved with 3D-printed components. A patient undergoing physical rehabilitation can take many months to gradually rebuild muscles, so the medical needs of the patient will change depending on the stage of recovery. While the system is a functional device, it is still a part of one's outfit and functions like a fashionable accessory. If you would like to see the Graduated Spine Support System in action, have a look here!